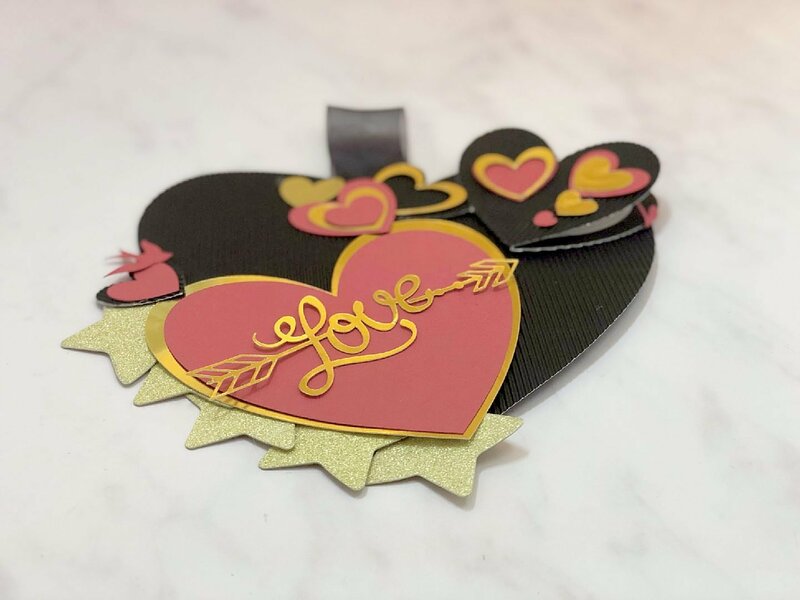 As its nearly Valentine’s Day I thought I would have a little go at making a Valentine’s Day card with my Cricut Maker. You know when you start out and have no idea of exactly what you want to achieve, only that is has to have lots of hearts. Be a card, but not a card, maybe a hanging card? And you want to put a paper cut somewhere on your design. I decided to just go with it and freestyle it. Cut all the parts I want to include in my design, make a cup of coffee, grab my glue gun and create. Don’t you just love having the freedom to do that sometimes? 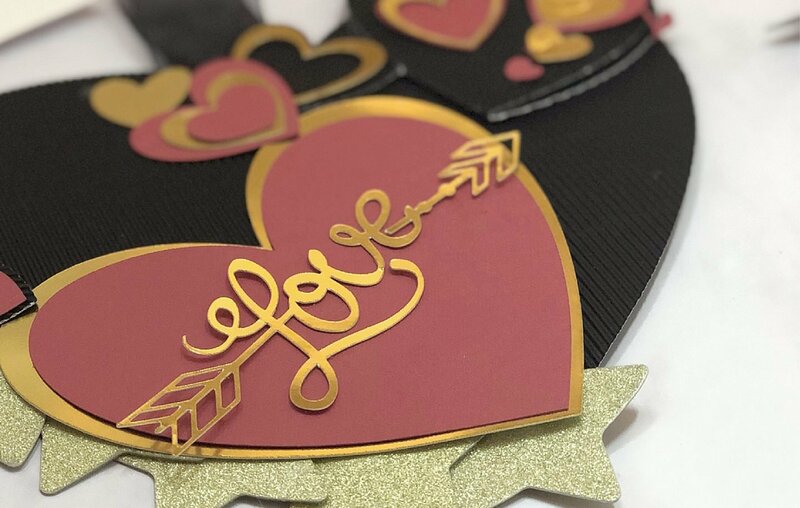 Just log into the Cricut Design Space and be creative. I used gold stars I had in my craft stash, these could be made in design space. Right lets get Cricut free styling! Ha ha how corny does that sound? But I do love not having any creative boundaries. Start in your design space by choosing a heart from the shapes section. Once you have your heart, right click and duplicate it 4 times and change the colour of each heart so you have your three hearts and your white card inlay heart. 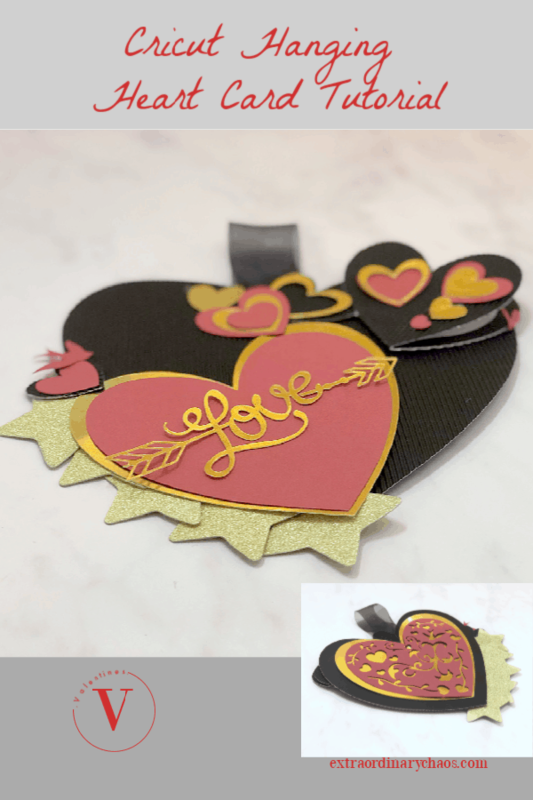 I had one large heart in black corrugated card, then made several smaller black hearts to decorate my card. I searched for a pretty LOVE in images, then for an arrow. To attach the arrow to the heart, I sliced the middle away from the arrow until I had a tip and tail. Placed then where I wanted then to sit on my word and welded it all together. To create an opening heart I welded 2 hearts together and created a score line. I then duplicated my white inlay heart and sized them to fit just inside the black heart. 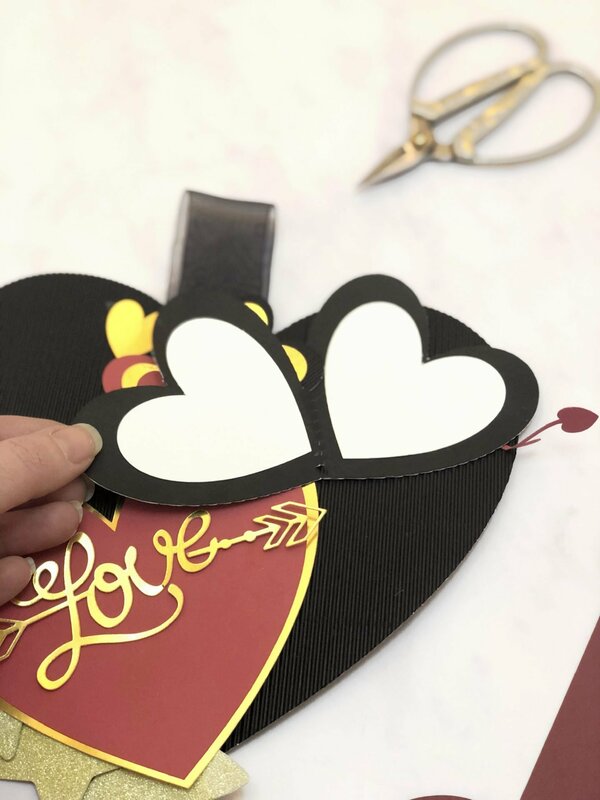 Once I was happy with the sizes of my black hearts, I moved onto my gold and red, if you watched my instagram stories you will see I was working with a darker red, but I really didn’t love it, so recut my red. The key is to size the hearts one inside the other so that they frame each other and you create lots of contrasting pairs of colours. 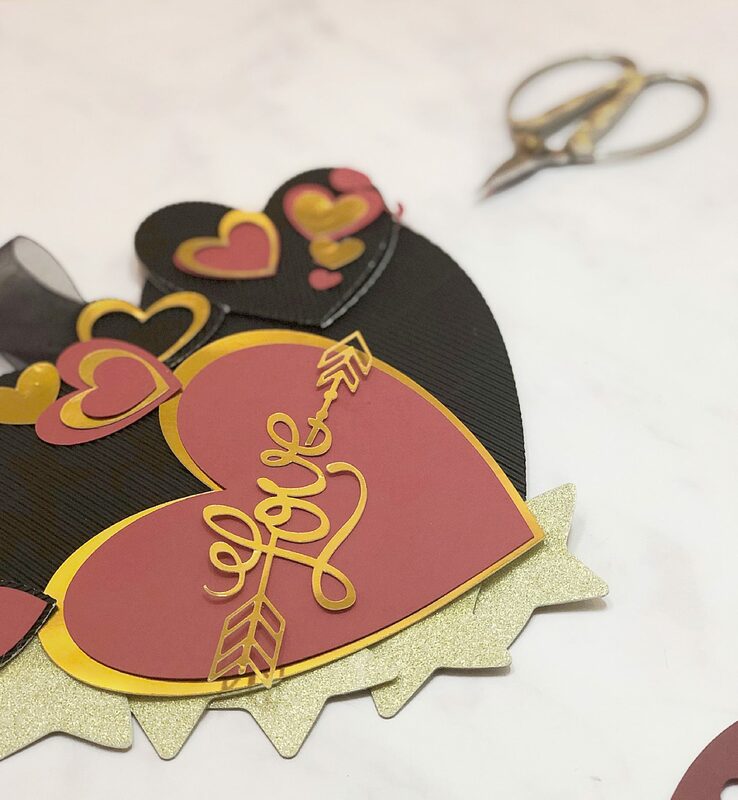 To create the hearts with the cut out centers you simple place a smaller heart on top of a lager heart and slice which will leave you with a cut out. 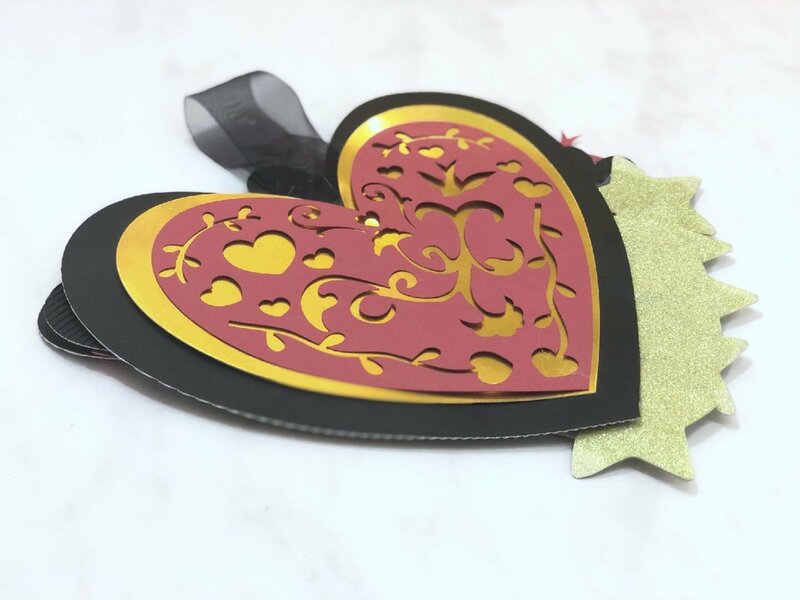 As I wanted my card to be of the hanging variety, I needed to back it so sliced into a large red heart, that was slightly smaller than my largest black heart. I find searching vines in design space always gives me lots of great options, and sliced vines, heart and a bird into my shape until I was happy. This took 5 minutes tops. l love that if I cut this design again, the result could look totally different. And that’s why we make homemade products isn’t it? to be unique. And if you have Cricut Design Space access, here is the project link. Check out my vlog for all that to make sense!